If you’re thinking of growing sweet peas this year, this weekend is a great time to plant them in the garden - and I can’t think of a better way to spend the bank holiday than prepping the garden for the summer season ahead. You can grow them from seed, in which case you would need to have sown them indoors or under glass in January or early February, but most garden centres are stocking young plants about now. Either way, make sure they are hardened off before you plant them outside, to lessen the shock they’ll get from moving outside into a colder environment. This just means gradually acclimatising them to outdoor conditions gradually over a week or two – garden centre staff should be able to tell you if their plants are ready to go. Give them lots of organic matter – they are greedy feeders and each plant will grow up to a couple of metres in height by the end of them summer, so they need plenty of nutrients – home- made compost or farmyard manure are the best. Give them a sunny spot and water in well after planting and once a week or so until they’re well on their way – organic matter will help the soil retain moisture so adding lots of it at planting time will save you watering time in the long run. 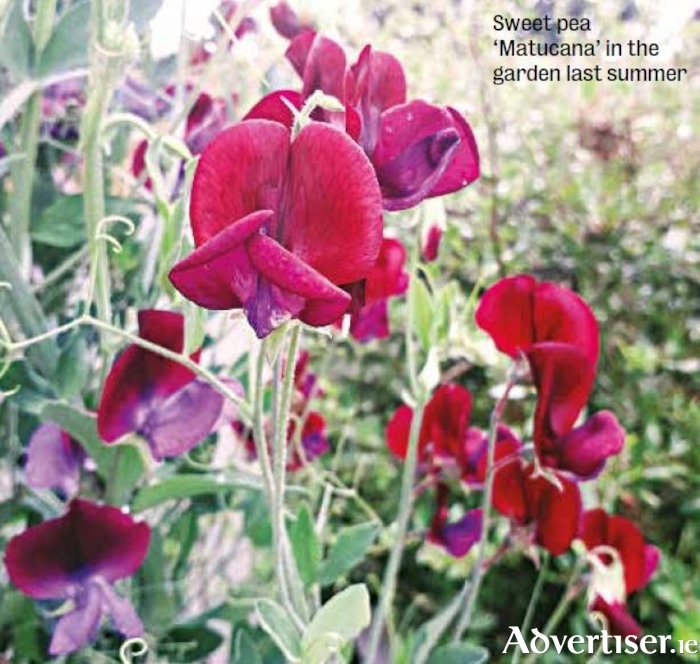 Do remember to protect the newly planted sweet peas from slugs, who are on the rampage at this time of year seeking out fresh, juicy shoots. I prefer to use organic slug pellets and most garden centres stock these now – the plants just need protecting for the first few weeks, until they’re strong enough to survive attacks. As they grow and new shoots appear, tie them in at intervals to your chosen support - I love to see them scrambling up bean sticks as if in a race to see who flowers first! Planting out around now should produce flowers in early July – with a bit of luck and some decent weather. Cut them to your heart’s content for indoors – the more you cut them the more they grow! or in stages. Anne’s design flair and passion for plants brings a touch of magic to gardens of all sizes. Page generated in 0.0568 seconds.